With cameras in the iPod nano and new export options in Snow Leopard’s QuickTime Player, creating and sharing movies with your Mac has never been easier. But the more movies you make, the harder it can be to show them all to friends and family. The My Albums templates in iWeb aren’t just for pictures––they can hold videos, too. Here’s how to use them to make life easier for you and your audience by organizing your movies in one convenient place online. 1. Share the movies on your Mac. Select File -> New Page to choose a My Albums template for your site from any iWeb theme. Next, select View -> Show Media, and click the Movies button in the Media Browser to see your iMovie projects, iTunes videos, and more. Drag the files you want to share onto your album’s main page. Notice that iWeb automatically creates a page for each movie, and you can drag the previews to arrange in any order you like. iWeb imports the movie with a cryptic naming convention, but you can change that name in the sidebar at the left of iWeb’s window. However, you must manually change the name on the individual page as well. 2. Round up stray YouTube videos. Adding a YouTube video to your album takes just a little more work. First, add a new Movie page to your album by selecting the album in the sidebar. Then select File -> New Page, and choose a Movie template. Next, open your YouTube video in a Web browser and copy its URL from YouTube’s URL address field or the address bar in your browser. Return to iWeb’s Media Browser and click the Widgets button. Drag and drop the YouTube widget onto your movie page’s video placeholder, paste the YouTube URL in the widget’s window, and click Apply. Albums let you rearrange movie previews easily. 3. Recycle the iSight widget. The easiest way to add videos to your Web page is with your Mac’s iSight camera. Reusing the iSight Movie widget keeps these videos in one place on your site. 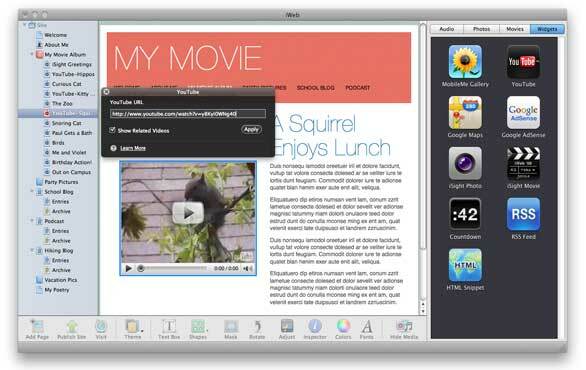 The YouTube and iSight Movie widgets can be dragged onto iWeb’s video placeholders. Add a new Movie page to your album, then drag and drop the iSight Movie widget from the Media Browser onto the video placeholder to start recording. Later, when you want to record a new movie, there’s no need to create a new page. Just select the iSight movie in iWeb and record a new video in its place. Adam Berenstain is a freelance writer based in upstate New York.